The Jumbo Roll Dispenser Toilet Paper Holder (VSP-JRDx1) accommodates any and all toilet tissue roll sizes including the gigantic jumbo roll 14" 2000 foot paper. These large capacities are ideal for restrooms that see extra high use. This unit was first developed to meet the traffic and heavy use of Highway Rest Stop facilities operated by Washington State D.O.T. Note!!! This product has been updated with a newer version, the AA-JRDx1. Note!!! This product has been updated with a newer version, the AA-JRDx1. While this product is currently still available, it is being phased out in favor of the new and updated design with more security features. Please consider ordering the newer product and updating your specifications where possible. 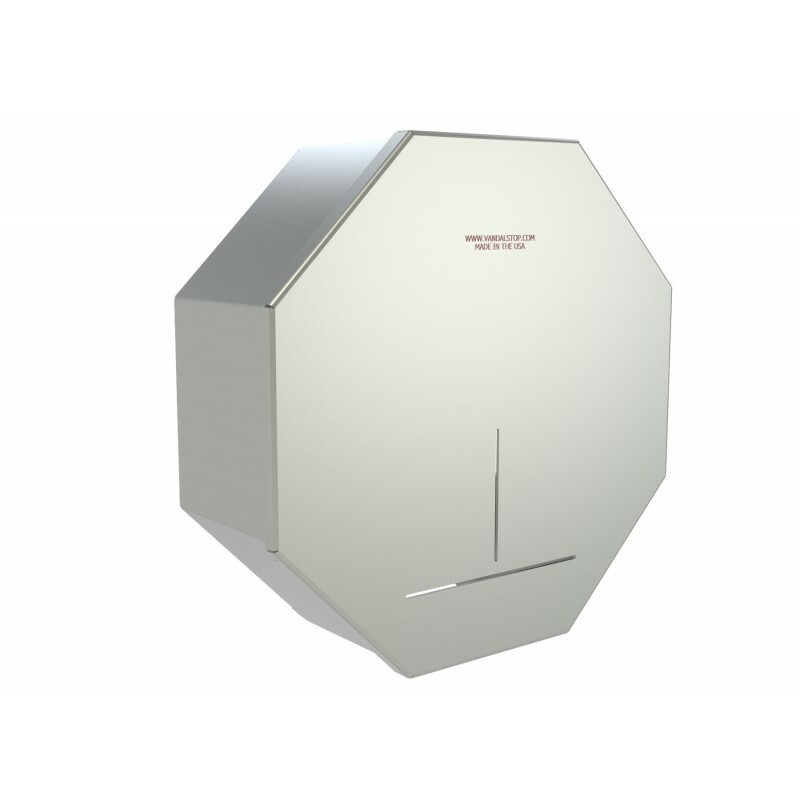 The VSP-JRDx1 is intended for remote outhouse facilities that need the best flexibility in paper use and capacity. The VSP-JRDx1 is available in 12 gauge Stainless Steel that will stand up to heavy use, abuse and vandalism. Featuring a shrouded lock, vandals and thieves will be foiled should they attempt to cut the lock with heavy duty cutters. The strength of the unit also comes from its unique octagon shape that provides extremely good structural rigidity. 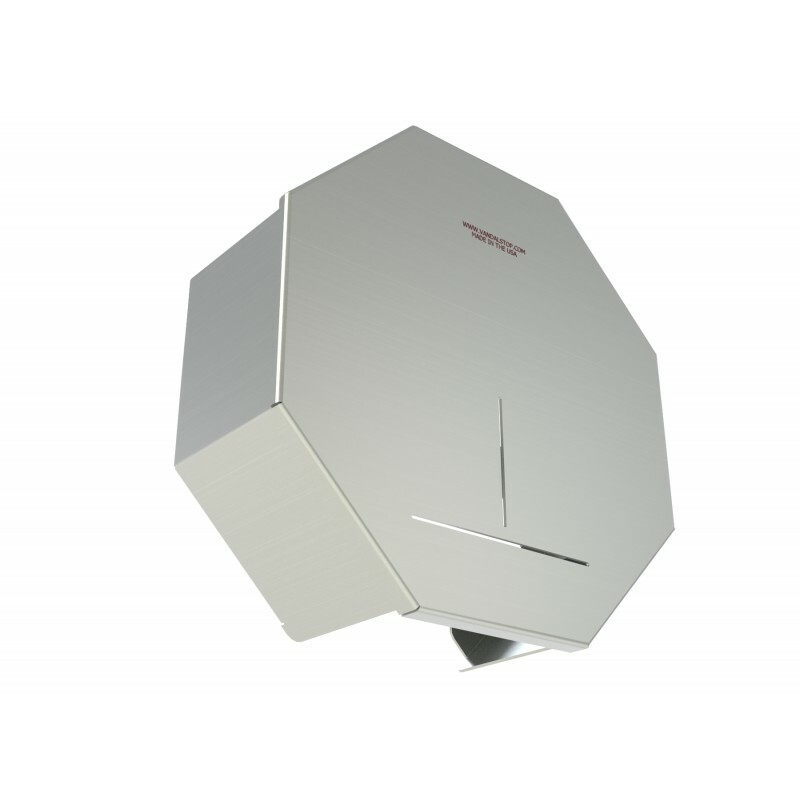 The VSP-JRDx1 toilet paper dispenser is one of our most versatile washroom accessories. It can accommodate a high capacity jumbo roll toilet paper up to 14” in diameter and any jumbo roll toilet paper up to that size. It also easily accommodates coreless toilet paper for even higher capacities. Should you desire to incorporate standard toilet paper size rolls for your public facility, there is an optional 5 spindle carousel (see VSP-JRDx5) that allows for 5 rolls of standard tissue sizes up to 5” in diameter. This washroom accessory is also drip deflective that will protect the paper from errant water during hose down cleaning. 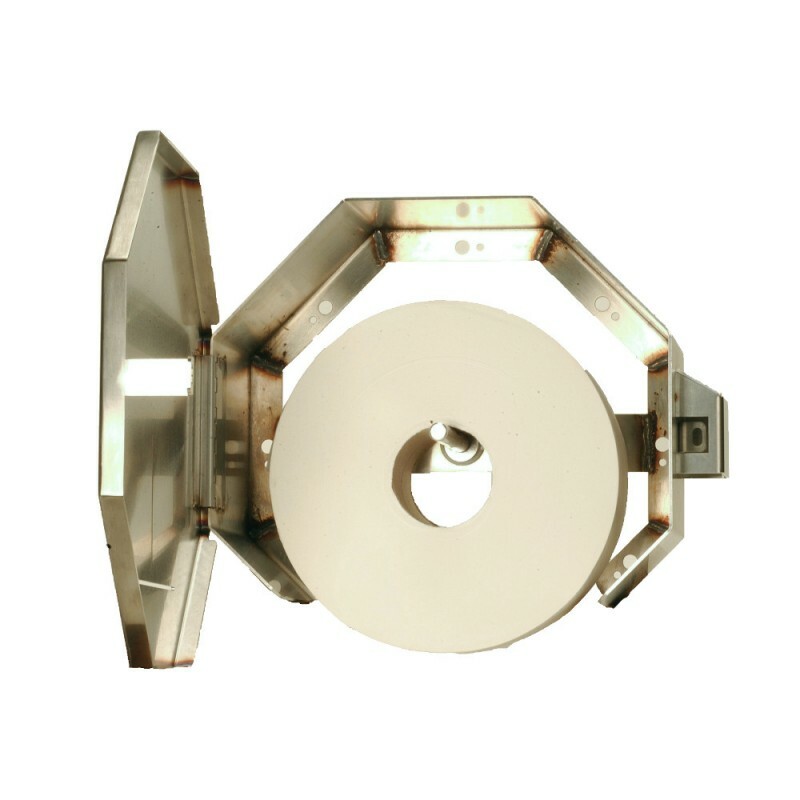 The VSP-JRDx1 toilet paper dispensers are ADA compliant when properly mounted and installed. 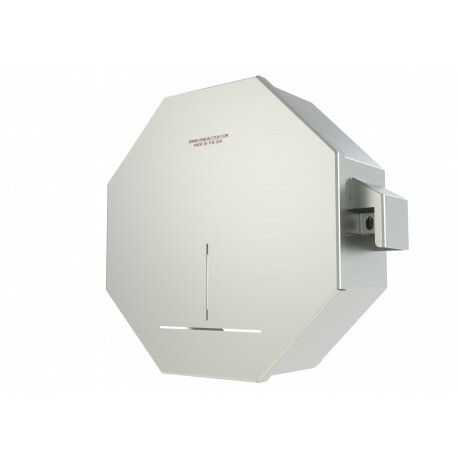 Past customers that are interested in the VSP-JRDx1 toilet paper dispenser include Public School Districts facing facility abuse from their students, Public Parks, Fast Food franchises such as McDonald's & Taco Bell, Remote facilities such as outhouses in the National Forest. Secure fixture to wall with appropriate 1⁄2” stainless steel anchoring hardware for optimal installation strength (not provided). Recommend 3⁄4” or greater back bracing for walls. Partitions may require T-nuts or other suitable anchoring devices. 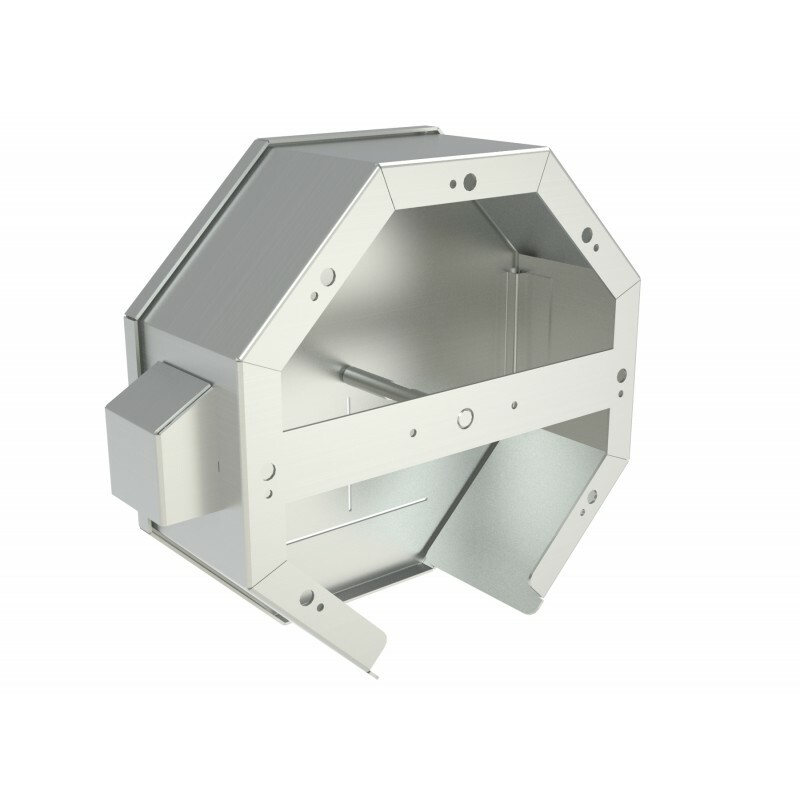 When possible it is recommended that units be through bolted back-to-back providing optimal installation strength. 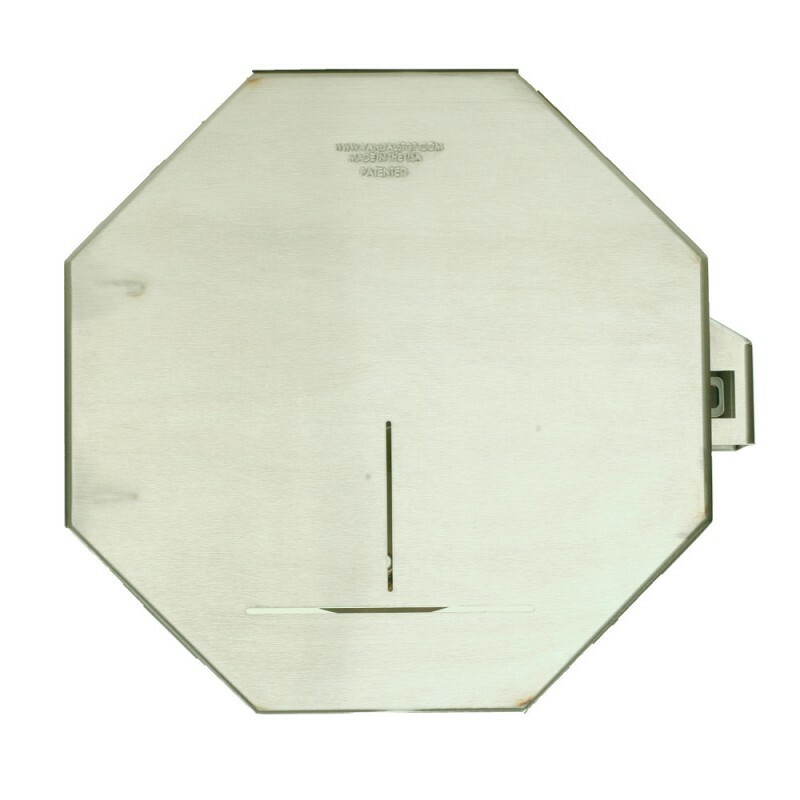 Dispenser shall be constructed with American made, 12 or 14 gauge 304L or 12 gauge 316L Stainless Steel joined /w TIG welds and edges de-burred. Dispenser shall not be cross-metal contaminated during manufacturing construction. Dispenser housing shall provide protective cover for tissue paper against drip and spray. Protective shroud adds security for padlock. 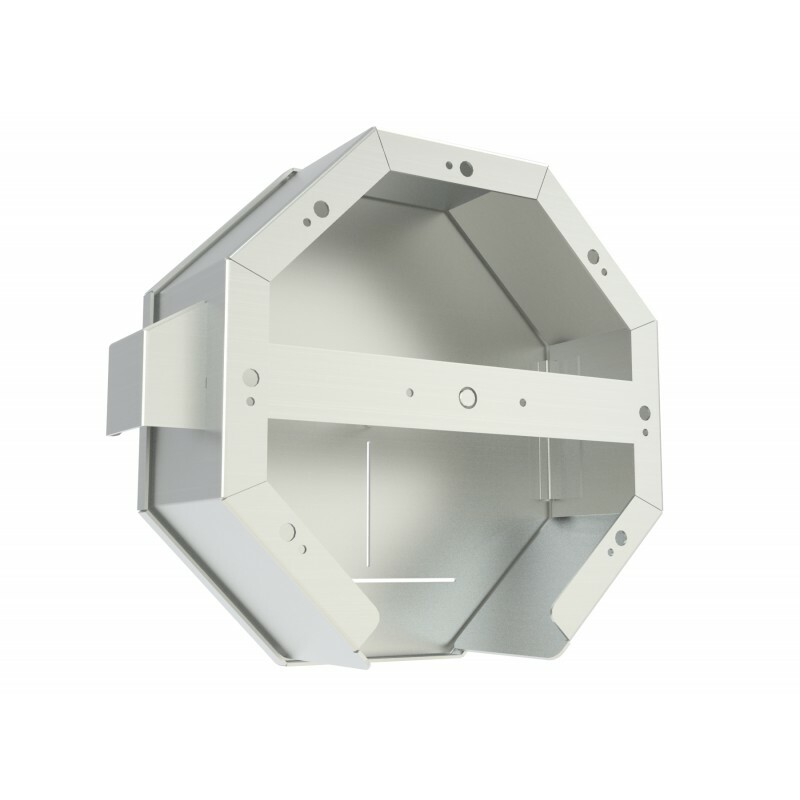 Dispenser shall have 3⁄8” mounting holes. Dispenser shall accept multiple paper styles. 12 Gauge models shall include a 10 year standard or 20 year optional functional warranty against vandalism when properly installed and locked while in service. 316L SS shall be used for US Navy maritime use or if exposure to salt water is prevalent.